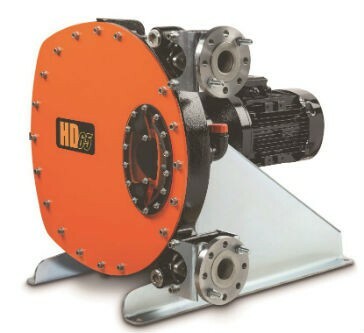 Abaque Series Peristaltic (Hose) Pumps have been upgraded to incorporate a stronger and durable rotor design and innovative hose holding system. Abaque pumps meet the challenging requirements of the oil and gas industry, thanks in part to their seal-free design that eliminates leaks and product contamination. These self-priming pumps can run in forward or reverse and offer suction-lift capabilities to 25.5 feet (9 metres), as well as the ability to run dry without adversely affecting performance, pressure and accuracy (no slip). Abaque pumps are available in ductile iron and stainless steel construction, allowing higher discharge pressure up to 217 psi (15 bar).